The fruit is picked in the first two weeks of November, although sometimes we start as early as the end of October, depending on the maturation of the fruit. 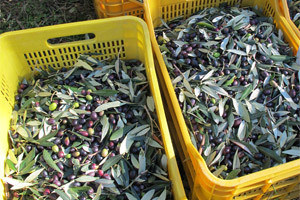 Olives picked earlier rather than later tend to produce an oil that maintains its essential characteristics longer; an early harvest also reduces the risk of damage to the olives from bad weather. 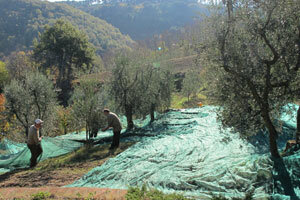 The harvesting is carried out basically by hand, with the fruit being combed down onto long nets spread beneath the trees. For the past few harvests, though, we have supplemented this with a pneumatic system that enhances the speed of picking and eliminates the need for ladders. From the nets the olives go straight into plastic crates, each holding about 20 kg and perforated to allow air to circulate, which are weighed and stacked ready for transport to the extraction plant. The fruit is thus kept in dry, aerated conditions right up to the moment it is processed into oil. This is very important for maintaining the quality of the final product, because lengthy and incorrect storage can cause fermentation and other damage to the fruit before it is processed. Ideally olives should be processed on the same day as they are picked, so that they are as fresh and free from defects (fermentation, mould etc) as possible. 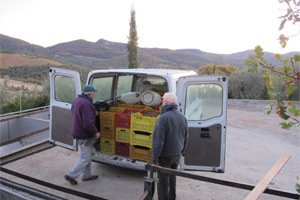 That is not always feasible on a small farm such as ours, so we have adopted a workable compromise by storing our olives in aerated crates and taking them every second day. In 2008 the crop was exceptional both in terms of quantity and of quality. In 2009 we produced750 kg of oil, which represents good average crop for us. The 2010 harvest went better than we had predicted despite all the rain:870 kg. As a result of the long hot and dry summer in 2011 we produced much less oil than in recent years: 600 kg. Luckily the quality was not affected by the heat or drought, so all things considered the year went pretty well. As for the 2012 harvest, the long hot and dry summer was followed by heavy rains in September, October and November, which increased the weight of the olives without increasing the amount of oil produced. We thus had a record harvest of 8300 kg of olives but only 819 kg of oil: barely 10% of the crop, whereas we usually get between 13 and 15%. Still, after the harsh winter and difficult summer we were glad to produce that much.